Erhun Oztumer celebrates scoring against Coventry City at the Ricoh Arena. Peterborough United’s Sky Bet League One fixture with Coventry City on Friday March 25 will now kick-off at 7.45pm and be broadcast live by Sky Sports. 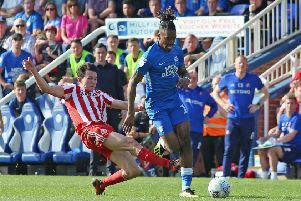 Graham Westley’s men, dubbed the entertainers by supporters and pundits alike, suffered defeat at Southend in their previous televised fixture this season prior to Westley’s arrival. Posh were beaten 3-2 at Coventry City in October after leading 2-0. Posh have also re-arranged their League One fixture with Oldham Athletic at the ABAX Stadium for Tuesday, February 9 (7.45pm kick-off). The Oldham game was orginally scheduled for Saturday, June 30, but Posh will be in fourth round FA Cup action aat Bristol City or West Brom on that day.